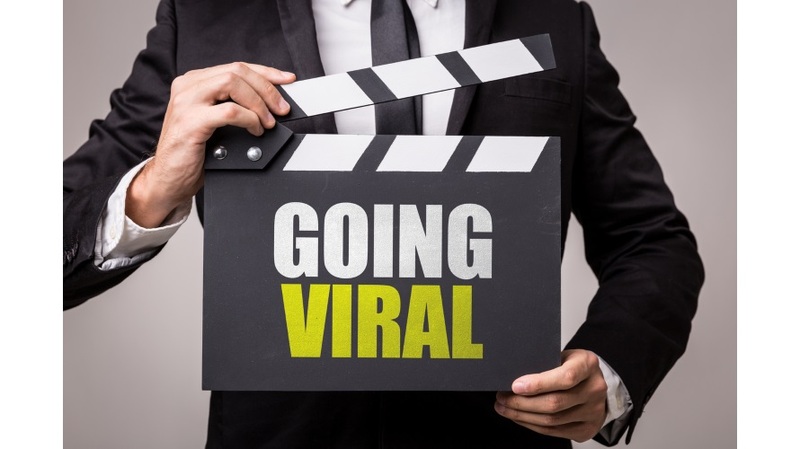 Having a video go viral is highly desired by every marketer out there. Viral videos can give your business a sudden lift, leading to increased traffic, perception and increased conversion. Research by Sizmek has proven that people are 27 times more likely to click on a video ad than a normal banner ad. This can result in massive growth in followers and revenue. Creating a viral video, however, is not an easy feat. Facebook is one of the best (if not the best) platforms for promoting your video, with 100 million hours of daily video watch time. Native videos on Facebook have 10 times higher reach than YouTube links. In November 2015, Facebook hit 8 billion daily video views. Video drives a 157 percent increase in organic traffic from search-engine results pages. Viewers retain 95 percent of a message when they watch it in a video compared with 10 percent when reading it in a text. 75 percent of male internet users are on Facebook, in addition to 83 percent of female internet users. Facebook is the most generally used social media platform, with 79 percent of American Internet users. This statistic is based on total population, and not just internet users. 68 percent of U.S. adults use Facebook. You know where your customers are. 22 percent of the world’s total population uses Facebook. 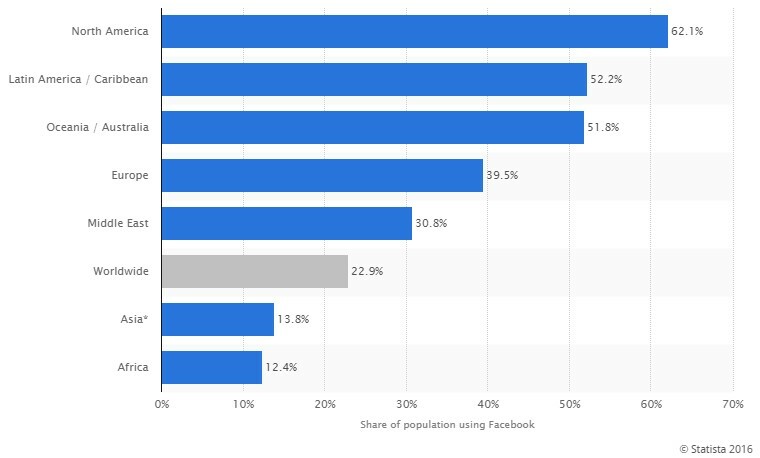 Percentage of global population using Facebook as of June 2016, by region (source). Research on advertising indicates that the emotional response to an ad impacts customers’ intent to buy much greater than the ad’s content itself. Neuro-imagery scans indicate that when consumers assess a brand, they make use of emotions based on experience and their personal feelings, instead of the information about the brand like features and facts. This shows that when making Facebook videos, connecting emotionally with your target audience is very important. Since consumers have a tendency to decide on a brand based on emotions rather than logic, the more emotionally intelligent your video is, the more likely it is to be shared and go viral on Facebook. Having a viral video on Facebook is like winning the internet version of the lottery. It can immediately take your brand to the next level. But having a video go viral is extremely difficult and often has to do with luck. Even Upworthy, regarded as the king of virility, has only 0.3 percent of its posts go viral. However, there are actions that you can take to greatly increase the chances of your video going viral. With planning, creating and promoting your videos, these six tactics will help you to get your audience connect emotionally with your message. For a chance to make your video go viral, you should create a video that will give your viewer an emotional reaction such as joy, laughter, anger, surprise, admiration, happiness or satisfaction. 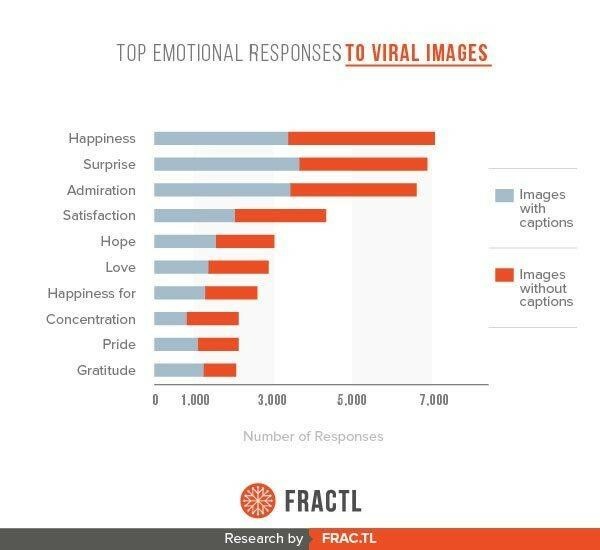 From the research above conducted by Fractl, happiness seems to get the most emotional response. That indicates that the ability of your video to create a feeling of happiness, surprise, admiration, satisfaction, hope, love, pride and/or gratitude in your viewers will most likely make them want to share your videos, which can ultimately make the video go viral. For example, the Thai Life “Unsung Hero” ad garnered more than 10 million views in two weeks and generated an earned media value of $43 million. It moved viewers to tears, reminding them of the value of life and empowering people to do good. You must know your audience before you can connect to them emotionally with your video. For instance, if your target audiences are millennials, they may react more to something that excites and make them laugh. Mothers will react more to hilarity and warmth, while Generation X (people over 40) are more likely to react to nostalgia and surprise. According to Cat Jones, Unruly’s head of business development, it’s quite hard in the U.S. and the U.K to make people share because of the video cause, but in Southeast Asia, people are a lot easier to persuade because they are kindhearted and relate to the cause. A survey published in The New York Times discovered that more than 19 percent of viewers had abandoned a video after only 10 seconds. The video had lost a shocking 44 percent within a minute. Our attention spans these days just keep getting shorter and shorter. For your Facebook video to go viral, you must tighten up your video creation by putting your most fascinating, interesting, inspiring, surprising or funny information first and foremost in the video. This ensures that your video will appeal to the emotional side of your viewers before they lose interest. When creating viral video content, you should never save the best for last. If you want your video to be highly shared and go viral, you may want to tap into current happenings. By hooking into an existing internet popular topic or current trend that people are already emotionally connected to, you increase the possibility of your video been viewed and shared by the people already interested in the topic. This can be a current topic or event dominating the media. For instance, observe the way people are so attached to Game of Thrones that they can’t wait for the next season to be out. If you speak the same language as your viewers and present videos in the same interests, they will be more apt to share your video. While content may be shared for many reasons, overall, content that elicits an emotional reaction tends to be more widely shared. In addition, stories stimulating positive emotions are more widely shared than those eliciting negative feelings, and content that produces greater emotional arousal (making your heart race) is more likely to go viral. To get the viral edge with your video, create videos that inspire your viewers, whether it’s a story of standing up in the face of adversity, overcoming struggle or simply attaining success. People love inspiring videos that make them feel positive and will want to share them with others. A CTA is used to persuade a website visitor to take a specific action that benefits you. At the end of your video, never fail to encourage your viewers to share, subscribe, visit your website or whatever you want to achieve with the video. Creating viral videos is not an easy feat. Otherwise, every business would have had some viral hits. However, if you can put these six tactics into play when creating your video, your chance of your video going viral is much more improved. Guy Sheetrit is CEO of digital marketing agency Over the Top SEO. Image courtesy of Ildo Frazao/iStock.